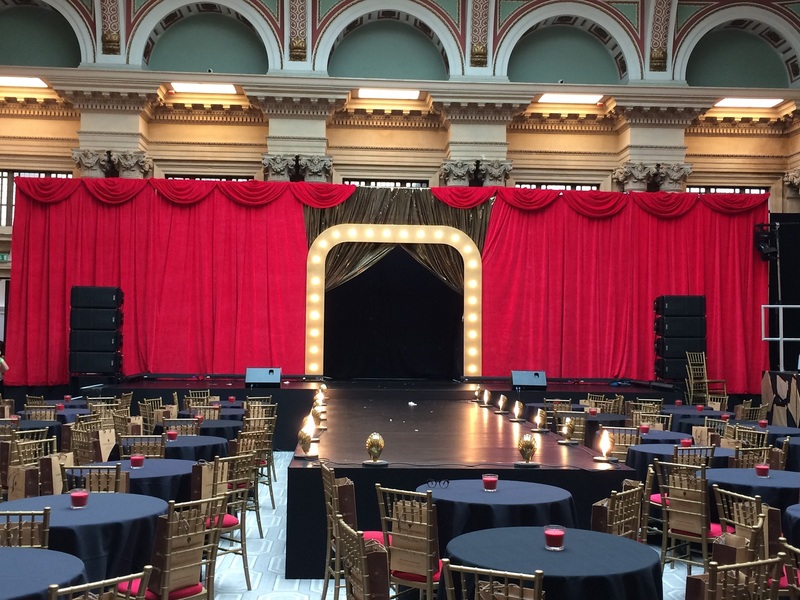 The Hobbs Show 2018 - Bristol Harbour Hotel - Evans Audio Visual Staging Ltd.
We were delighted to provide in conjunction with our colleagues at Utopium Lighting, all the technical support and staging required for the Hobbs Show 2018 on June 16th at the Bristol Harbour hotel. This year’s event had a burlesque/louche cabaret theme rather than a straightforward fashion show as produced in previous years. 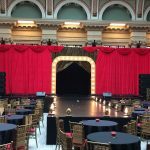 To that effect we provided an 18m x 5m backdrop in scarlet velour drapes with matching swags finished off with gold lurex drapes and a golden arch with inset lights for the performers and models to enter stage centre. Matt O’Brien our senior audio operator specified our Nexo S series full range line array comprising 8 x 1210 with 4 x L18 subs to provide the basic pa system this controlled by one of our Yamaha C5 mixings desks. The MC and performers used Shure digital headset and handheld radio microphones with onstage monitoring taken care of by QSC K12 cabinets. The lighting system designed by Colin Bodenham and operated by Mike Beare, comprised 6 x vertical truss towers with Utopium Lighting’s new moving LED fixtures, led battens on the stage, feature shell lights for the catwalk, 2 followspot with operators took care of the live action. An early start, late finish ( par for the course), all went to plan with a delighted producer Doug Hobbs, a thoroughly entertained audience who went home after midnight very happy having watched 17 different acts, a fashion show and a charity auction. All proceeds from the event went as per usual to charity, this time to the very worthwhile charity Bristol help the homeless.